Qualcomm enjoyed a very profitable 2013, with its Snapdragon 400, 600 and 800 System-on-Chips practically dominating the mobile market. And to keep manufacturers interested in Qualcomm's offerings, a refresh of various tiers of the Snapdragon line were recently announced. Specifically, we have six new Snapdragon SoCs coming out this year. On the top tier, we have the Snapdragon 801, which will be found inside the Samsung Galaxy S5 and the Sony Xperia Z2 and Xperia Z2 Tablet, as well as the Snapdragon 805, which is even more powerful than the 801, but will be available later this year. On the 600 tier, Qualcomm will offer the Snapdragon 602A, which isn't intended exactly for mobile devices, but rather, it's Qualcomm's offering for in-vehicle infotainment systems. Two 64-bit Snapdragon 600 variants will be available later this year too, the 610, which packs a quad-core CPU, and an octa-core variant named 615. The Snapdragon 410 is also due this year, and it'll pack a 64-bit CPU too. So you might have noticed that, unlike with last year's Snapdragon lineup, where the designation 200, 400, 600 or 800 made it very clear where each tier stood, this year's numerical designations are a bit of a mess. It's still clear that the 805 and 801 are faster than the 610, 615 and 602A, which in turn are faster than the 410, but there might be some confusion between different variants of the same tier. For instance, 805 could be easily confused for 801, and the same goes for 610 and 615. It's just not as simple to understand as last year's lineup. Not only are the 2014 Snapdragons' nomenclatures messed up, but so are the architectural differences between the new SoCs. You might have noticed that while the 600 and 400 tiers are being upgraded to 64-bit CPU cores, the 801 and 805 are stuck with 32-bit capability, which simply does not make sense. Logically, 64-bit would come to top-tier processors first, and then make its way down to the subsequent tiers, but Qualcomm inexplicably decided to do the contrary. In any case, as it stands, the ability for 64-bit processing still isn't a very important feature in mobile devices, especially since Android OS doesn't even support 64-bit processing. So let's analize each new Qualcomm SoC one at a time, starting with the high-end. The Snapdragon 801 processor, found in recently announced Samsung and Sony flagship smartphones and tablets, is merely a mild upgrade over the Snapdragon 800. The biggest change in the 801 is the addition of eMMC 5 support, which will allow for faster flash storage solutions. Other than that, we still have a quad-core Krait 400 CPU, although the clock speed has been ramped up to up to 2.5GHz. This represents an ~8.7% speed increase over the Snapdragon 800. The Snapdragon 801 also keeps the Adreno 330 GPU, but increases its clock speed from 450MHz to up to 578MHz (~28% increase in theoretical performance). The memory interface, while still dual-channel 32-bit DDR3, gets a clock speed increase to 933MHz, which results in 14.9GB/s theoretical memory bandwidth, up from 12.8GB/s in most Snapdragon 800 variants. And that's all. Even though the architecture remains unchanged, the clock speed boosts should give the 801 a considerable performance advantage over the 800. Then there's the Snapdragon 805, which will be available later this year and will employ a quad-core configuration of a refresh to the Krait 400 CPU core, the Krait 450. The new CPU's improved efficiency allows for clock speeds to go up to 2.7GHz. Unfortunately, the Krait 450 core is still based on ARMv7, in other words, it doesn't support 64-bit processing. The GPU in the Snapdragon 805 gets a huge uplift, with the new Adreno 420, which brings a DirectX11-class feature set, improves on texture performance, as well as adds dedicated tesselation hardware, something previously seen only on PC graphics cards. The memory interface also gets a huge boost with the Snapdragon 805, moving to a 128-bit wide (quad-channel) LPDDR3-1600 interface. The added interface width results in peak theoretical memory bandwidth of 25.6GB/s. For comparison, most mobile SoCs today top out at 14.9GB/s. The Snapdragon 805 doesn't bring any big changes in comparison to the 800, with only mild improvements on the CPU side, but the new, more capable GPU and the impressively wide memory interface are enough to make the Snapdragon 805 an excellent processor. When it's available, I imagine it'll be quite capable to compete with the Tegra K1, the Apple A8 and whatever Samsung has to offer by then. Moving down to the Snapdragon 600 tier, we have the new Snapdragon 602A which, as stated before, isn't meant for mobile devices, but rather for in-car infortainment systems, an area where many companies, NVIDIA included, have suddenly become interested in. Not much is known about the 602A, but we know it'll have a quad-core Krait (400?) CPU and an Adreno 320 GPU. The Snapdragon 610 is one of the few Snapdragon processors that support 64-bit processing. It has four ARM Cortex-A53 cores (clock speed unknown) and an Adreno 405 GPU; so far we don't know anything about the GPU, although if it turns out to be a cut-down Adreno 420, we can expect the DirectX11-compatible architecture and the dedicated tesselation hardware. For the record, the Cortex-A53 is the lower end of the two Cortex-A5x CPUs released so far, and it's performance relative to current CPUs is still to be seen. 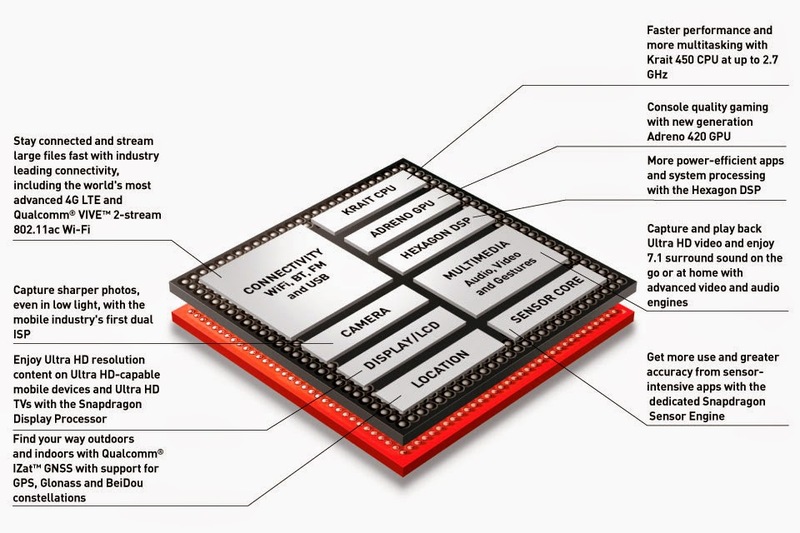 The Snapdragon 615 is essentially a 610 with four extra CPU cores inside. So it keeps the Adreno 405 GPU, but moves to an octa-core Cortex-A53 CPU. I'm a bit disappointed that Qualcomm decided to increase core count rather than use a more powerful CPU core. Most applications scale better to a fewer amount of threads, so not only will the last four cores or so probably end up not being efficiently utilized, the weaker single-threaded performance of the Cortex-A53 will hurt overall performance in applications that don't scale well to multiple threads. I would've preferred if Qualcomm had used a fewer number of the high-end Cortex-A57 cores, or even used its own Krait cores (even if that meant sacrificing 64-bit processing). Finally, there's the Snapdragon 410 mid-to-low-end processor, which combines four 64-bit Cortex-A53 cores at a clock speed of 1.2GHz with an Adreno 306 GPU (since this GPU belongs to the 3xx series, I suspect it won't have the architectural upgrades that the Adreno 405 and 420 got). Not much to go on about here, except to point out that even the weakest Snapdragon processor got an upgrade to 64-bit processing, while the high-end processors didn't. While I believe that until mobile processors built on a 22nm process show up there won't be another big leap in SoC performance, I'm not very impressed with Qualcomm's 2014 lineup. The Krait 450 CPU is a very small upgrade compared to the Krait 400, and the excessive use of the Cortex-A53 CPU core in the 600 and 400 tiers is rather disappointing because of the lower-end nature of the Cortex-A53. I'd talk about Qualcomm's decision to give the lower-end processors 64-bit processing, while leaving the high-end stuck at 32-bit, but since it's likely that a) Qualcomm doesn't have a 64-bit successor to Krait yet and b) The Cortex-A57 core is still not available, and since I wouldn't like to have seen more Cortex-A53s on the 800 tier, I won't comment on it. I also might as well reiterate how Qualcomm's nomenclature for its new SoCs can be rather confusing. On the bright side though, at least the Snapdragon 805 is bound to be very competitive, if not industry leading, in terms of GPU performance and memory bandwidth.